Our production facilities in Saint-Florentin, France include automatic weighing, mixing, milling and moulding processes as well as assembly units; all within the strict quality control. The production unit in Gennevilliers, a few kilometers from Paris, includes powder mixing plants, molding presses, high-temperature sintering furnaces and grinding machines, in compliance with quality control checks. The proven R&D and Testing team continuously implements its extensive expertise for product development, design and industrialization activities to offer more cost effective products to its customers. The Technical Centre is located at Gennevilliers (5 km from Paris) with a dedicated team of scientists and engineers. 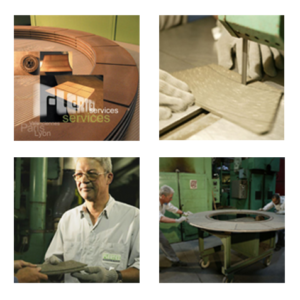 The R & D department has the necessary technical and processing resources to develop technically advanced friction products. To verify the design parameters of the product development projects. For automotive and motorcycle applications, as well as for product development and quality control purposes. We are specialized in bonding tailor-made brake and clutch linings to metal supports. Our two dedicated “service workshops” can promptly provide the necessary adaptations and repairs to brake or clutch assemblies. Through our regional distributors, the company can provide the necessary support to its customers in a timely manner. The company is ISO certified since 1995 and EN 9100 certified for aviation since 2007. Aware of environmental issues, FLERTEX strives to maintain its high level of quality and service along the lines of the ISO 14000. We have several products in our portfolio that are UIC approved as well as those that have been granted customer specific approvals.